Welcome to the 2017 Solar Eclipse! 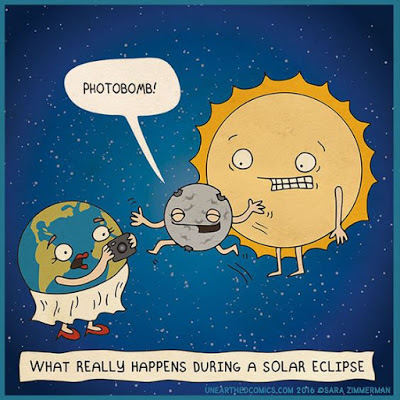 In this blog post you'll find a variety of resources to help you learn more about the eclipse. Some of the resources will ask you to log in. You'll log in through Clever. Need help? Raise your hand and let me know. Check out these videos that describe the Solar Eclipse. You may not be able to view these on your student Chromebook, but they will be available to view from a home device. Read more about the Solar Eclipse here. Use the Solar Eclipse Note Taking Guide to write down at least 10 interesting things you've learned about Eclipses. Finally, here's a digital escape room. Play this game to try to access the telescope to see the Solar Eclipse. You'll have to click around to unlock clues to move through the game. The clues will help you unlock more. My best time was 15 minutes and 38 seconds, see if you can beat my time!